Having radiator or cooling system trouble is a worrisome, engine damaging negative; this radiator flush treatment from Mega Power will end them or you - and protect your engine and transmission while doing so! How will Mega Power do more to protect your engine and transmission while doing so, you may wonder? While few part store cleaner products do any good - and some are caustic, Mega Power is not caustic, yet cleans deeper by removing oxygen films - that act as a blanket to keep heat in. If not removed, both the engine and transmission have to hold more heat as the radiator heat transfer ability will be hampered by an almost unseen layers of oxygen - which acts like bubble wrap - to slow down heat transfer- causing oil to overheat, weaken, and cause more friction. If your car overheated, you know greater amounts of friction show its ugly head by putting a noticeable strain and faster wear out pattern on your motor and transmission. Mega Power Engine Treatment also sold on this page, will restore your full like new engine performance. Both engine, transmission, and radiator flush treatment service with Mega Power is easy, fast, and will add years more great life and operation to your cars and equipment - customers tell us. Add the white bottle, marked R1 on the cap, to your coolant and run motor for 10 minutes. Replace old coolant with new. Along with the new coolant, add the 2 blue items marked R2 and R3t on the cap. That's it! you're done! Radiator flush treatment fixes. Tips to stop leaks. Following the steps above will stop any coolant leak in the process as good as those selling for twice the price of Mega Power Radiator Flush Treatment. Coolant last two years. Coolant anti-freeze is always mixed 50/50 with water. Replace hoses when the vehicle is five years old - along with belts. Do so when the the coolant is replaced. Special stop leak additive should be added at each fluid change after age 5 of the vehicle. Used the type that has no strings or pellets. Go here for that info. A product that helps coolant transfer heat faster can also help cars that run hot. This is great for commercial vehicles, tow trucks, ambulances, police cars, vehicles that tow. Go here for that info. It usually cost about $50 more to buy a new radiator than to unplug one. That is a good way to correct a radiator cooling system problem. Radiator cooling system fixes. Radiator leaks: When a coolant flush is a rip-off and when not! A fluid exchange machine is a quick way to replace old coolant. I feel it is a rip-off when only the fluid is sold and replaced. The right way is to add a pre-cleaner advertised as an acid neutralizer and scale remover just prior to the fluid replacement. This cleans the system and removes the number 1 & 2 problem makers along with the old fluid. Always pay for a pre-cleaner which is added five minute before the coolant is replaced. Go here for that info. This review covers the 3 Best Radiator Cooling System ingredients sold anywhere. Our Mega Power Radiator Flush Treatment. works on Cars and Heavy Equipment. Is so scaled down, 33% of its former size is gone! Taken away to help reduce your cars weight, improve fuel economy, and put more profit in the car makers wallet - not yours. For this reason, it takes very little to overpower your cooling systems cooling ability - and ruin both your engine and transmission - you would never know its happening - until its to late. I wonder if the car makers and part suppliers know of that weakness. The product we favor cannot be beat for its cooling system preventative and problem solving advantages. This page and web site will help you avoid that expense - and thousands of dollars more avoidable car and equipment repair expense - if, your car seems still runnable. Directions: Add Mega Power Cleaner to old coolant. Run motor or drive for 10 minutes. Drain and replace old coolant with new. Add Mega Power Stop Leak and Mega Power Conditioner with new anti-freeze coolant. Leaks stops from instantly to overnight. driving sets stop leak - which crystalizes when hitting air. Mega Power comes with three products shown, easy-to-follow directions, phone help if needed, guarantee. Shipped FedEx, direct to your home, business, or shop. Order online or by phone. 1 512 665 3388. One MP Radiator Cooling System Service #RS3. 3 item system service as described above. Just $50+ $15 s&h= $65 total. 2 Treatments for both of your cars: Just $95+$15s&h= $110 total. Save $20. 6 radiator Treatments for fleet or resale. 18 items. Just $200 +$15s&h= $215 total. Save $115. To order the Mega Power Engine, Transmission, and Radiator Treatments - to service and protect the whole power train, as described above. 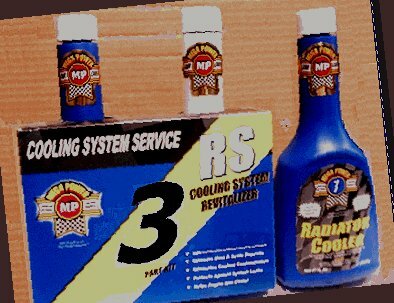 Order all 3 treatments: one for your radiator, one for your motor, and one for your transmission. 12 item total. $140 plus $20 s&h= $160. Save $75. Order above Whole Car Treatments for 2 vehicles. 24 items total. $200 plus $15 s&h = $215 total. Save $90 and service and protect both your vehicles for years to come. To order, Or ask a question about your car problem by phone, call me... george at 1 512 665 3388 [ Mention this page for these prices. Canada and Mexico add $25 to shipping amounts].